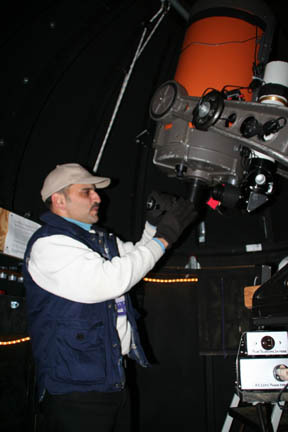 Operating the 14-inch Schmidt-Cassegrain telescope at the Sue Rose Observatory in Southold, NY on a cold December night. Schickard Crater - This photo shows the location of the walled plain Schickard. Moon-Jupiter Conjunction - This photo shows the August 6, 2009 conjunction of the Moon and Jupiter. Moon Walk - An incredible simulation of a Moon walk. Clavius Crater - 140 mile diameter crater near the Moon's South Pole. Struck by a meteor! - And lived to tell the tale! Copyright 2004 - 2019, Bill Crispino, All Rights Reserved.